CarGurus has 42,196 nationwide Acadia listings starting at $2,900. On the highway, the Acadia shines at speed, riding smoothly and quietly, and the brakes are plenty capable of reining in this rig’s momentum. Let’s face the facts on plush, carlike SUVs with 3 rows of seats. They didn’t get popular because American families faced an influx of motorboats appearing on their lawn, requiring a powerful vehicle to tow them out. These rigs are the anti-minivans, a group of taller, more imposing models with all-wheel drive and flashier trim. In this crowd, the GMC Acadia is a semi-luxury SUV sandwiched between the brand’s compact Terrain and the full-size Yukon and school-bus-size Yukon XL. It’s incredibly versatile with its many trim levels and a competent player in a busy segment. But after 7 years on the same platform, can the latest Acadia measure up? Let’s take a look. At its core, the 2014 Acadia is much the same as the version that debuted alongside the Saturn Outlook for 2007. With Saturn long gone, the Acadia shares its mechanical components and basic dimensions with the Chevrolet Traverse and Buick Enclave. 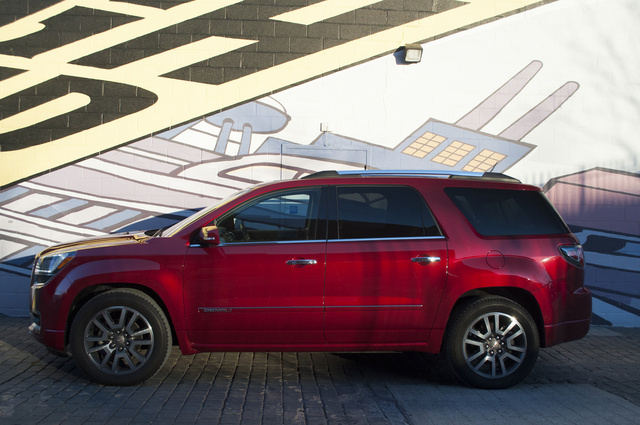 The Acadia is the middle child between the more affordable Traverse and the premium Enclave. All three models received a thorough in-and-out refresh for 2013. The Acadia’s squared-off front end, especially with the thick, three-bar chrome grille and curved, Audi-like LED lights, makes the proudest and most prominent statement of the three. The Acadia starts at $35,410 and climbs through 4 trim levels before reaching the level of our loaded Denali tester, which stickered at $52,335 including a $2,240 package for navigation and a rear-seat DVD entertainment system. Our car’s $495 Crystal Red Tintcoat, tasteful splashes of chrome trim and meaty 20-inch aluminum wheels made this normally hulking GM SUV into something truly handsome. The integrated chrome exhaust tips in the rear bumper show GMC’s attention to detail, though if you don’t splurge for this top-notch trim, the Acadia looks more average. 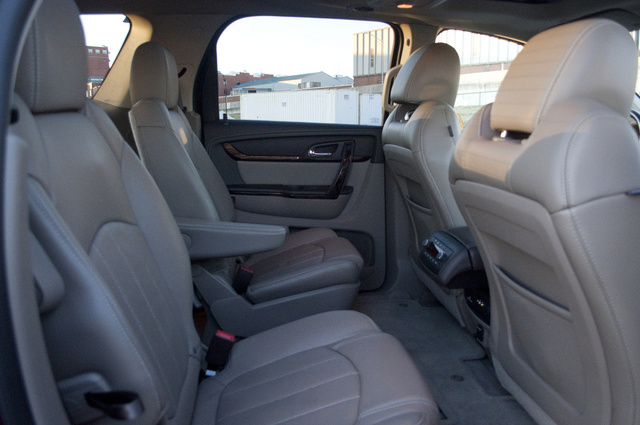 Inside, the Acadia sits 8 (or 7 with reclining second-row bucket seats, a no-cost choice on SLE-2 trims and above). As for minivan functionality, the Acadia has more than enough room to swallow a couch sectional with both seat rows folded. Acadia models are available with one engine, a 3.6-liter V6 with 288 hp and 270 lb-ft of torque, routed through a 6-speed automatic. Your only choice is front- or all-wheel drive. 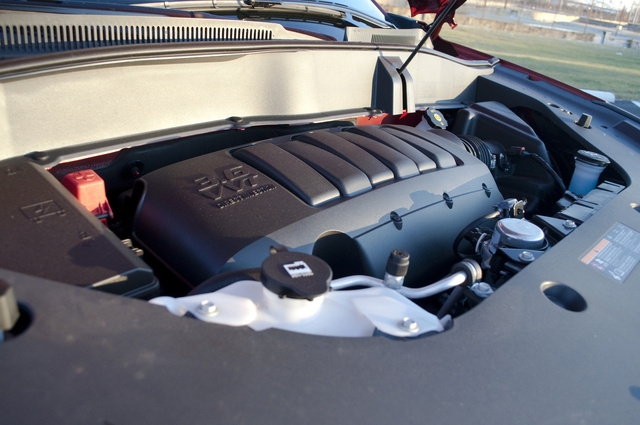 Even though the engine is thoroughly modern, with efficient direct injection for greater fuel economy and power, the sound is coarse, and the transmission acts like it’s always towing something—it’s sluggish and reluctant to kick down. Compared to newer 3-row SUVs like the Dodge Durango and Hyundai Santa Fe, the Acadia’s driving dynamics could use a sharpening, especially the slow, loose steering that makes the vehicle’s almost 5,000-pound weight much too evident in city driving. On the highway, the Acadia shines at speed, riding smoothly and quietly, and the brakes are plenty capable of reining in this rig’s momentum. Over a long drive from Boston to Baltimore, we averaged close to the EPA-estimated 23 mpg highway. In the city, it’s rated at 16 mpg. Both figures are par for the class. At night, the Acadia’s soft red glow and accent lighting on the dash, along with supportive seats and great visibility, made our trip a breeze. It’s nice to see a voltmeter in the gauge cluster, too, to keep an eye on the battery in case of a failure. Second-row passengers have plenty of elbow room and can operate the climate controls and optional entertainment system. Those seats also slide forward several inches to make the third row far less of a crawl space than in most SUVs. During an extremely cold winter, the Acadia’s remote start feature was brilliant, like on all GM vehicles. The heated seats switch on automatically, as do the front and rear defrosters. The leather is low-quality, and whatever tries passing for mahogany trim feels fake, which at this price point is disappointing for a vehicle brand that calls itself “professional grade.” It’s also hard to tell the difference between chrome-look plastic surrounding the cupholders and shift lever and the aluminum on the center stack GMC claims is genuine. The touch-sensitive controls surrounding the touchscreen LCD for the radio, trip computer and navigation look sleek and modern, but they operate just as poorly as they do in Cadillac and Ford models. Two times out of three, they don’t work. There is no physical feedback that you’ve activated anything, just some raised trim underneath each “button” that you keep trying to push, only to realize they’re just separators. Real buttons and knobs control the climate, heated and cooled seats, liftgate and other functions. Those work and feel great, as do the radio and cruise-control buttons on the steering wheel. 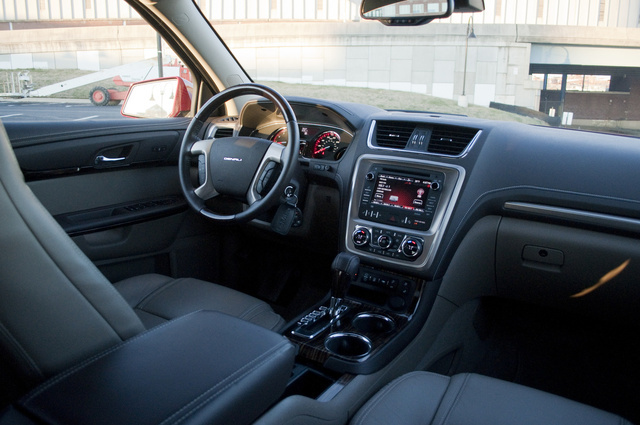 Overall, the Acadia’s interior is functional and understated, although material quality needs an overhaul. 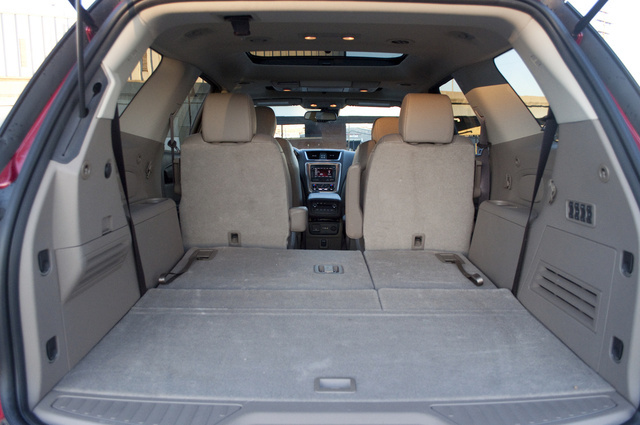 Step inside the new 2015 GMC Yukon and you’ll immediately realize how much. Aside from the button squabbles, the Acadia packs a lot where it counts. The infotainment system is fast, easy to operate and has a reconfigurable home screen that lets you access your most-used features, such as Bluetooth streaming audio or apps like Pandora, right up front. The 6 radio preset groups let you store stations across AM, FM and SiriusXM without having to switch back and forth between frequencies. HD radio and USB connectivity for portable music devices are also on hand. Our Acadia’s 10-speaker Bose 5.1 Surround Sound system filled the interior with crisp highs and punchy bass, certainly better than Bose systems we’ve heard in other GM models. The navigation system shows live traffic and can pop up weather alerts based on your route, and voice recognition for address inputs and other vehicle functions is welcome, if annoyingly imperfect, as we’ve found in every new car. The optional rear-seat flip-down LCD screen and DVD player, bundled with the navigation and stereo, can’t compete with personal tablets or the high-def HDMI inputs and Blu-ray compatibility of the Durango. The power-folding auto-dimming mirrors, bright xenon headlamps, power liftgate, head-up display and double moonroofs were particularly upscale touches on our Acadia Denali. With all these nice toys, you won’t be left wanting, no matter how long the trip. Along with top ratings from the government and Insurance Institute for Highway Safety, the Acadia has one standout safety item that no other vehicle in the world can claim: a “front center” airbag that deploys as a secondary side airbag from the driver’s seat. The idea is to cushion the impact between driver and passenger during a side-impact collision. 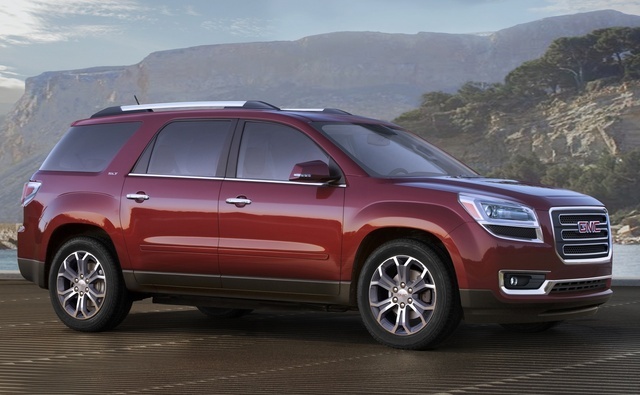 It’s standard on every Acadia save for the base SLE-1 and, as part of the GM family, is also available for the Chevrolet Traverse and Buick Enclave. It’s a fantastic idea, and GM deserves to be praised up and down for this advance. Active safety features like forward-collision alert and lane-departure warning are optional in the SLT-1 and SLT-2 and standard in the Denali. Blind-spot detection and rear cross-traffic alert—which detects cars from the sides when reversing—are standard only for the SLT-2 and Denali and unavailable elsewhere. We wish GM would offer these safety features across the board instead of limiting them to more expensive trims. OnStar with automatic 911 assistance and stolen-vehicle tracking is standard, as is a backup camera. If you’re set on a SUV in this style, you can save a few thousand dollars with the nearly identical Chevrolet Traverse, which eschews some of the Acadia’s styling glitz and luxury features. Still, the Acadia offers a lot of SUV for the money, especially with GM’s 2-year, 24,000-mile maintenance plan, which includes scheduled checkups, oil changes and tire rotation. Three things don’t hold up at any price: the Acadia’s mediocre driving dynamics around town, its antiquated transmission and the fussy touch-sensitive buttons and general confusion we get from GMC as a brand. Is it a nicer Chevrolet? A semi-Cadillac? Half a Buick? If identity crises don’t faze you and highway driving is a big part of your mileage, the Acadia is a pleasant choice. Above $50,000, however, the Acadia shows its wrinkles next to sportier, fresher SUVs like the 2014 Acura MDX and 2014 Infiniti QX60. Keep the price down and you’ve got a reasonable contender. 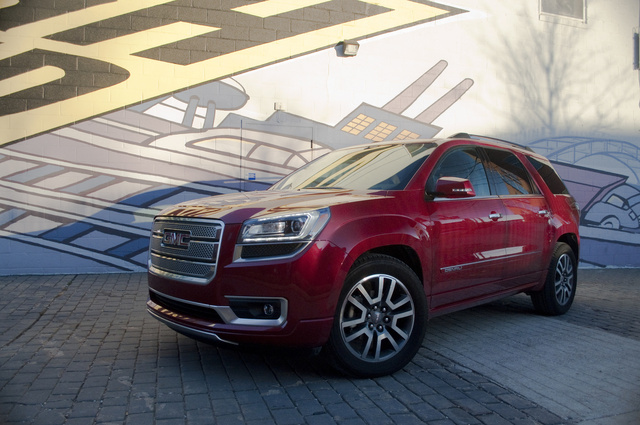 What's your take on the 2014 GMC Acadia? themountainman I rate the 2014 a 9 our 10. Great vehicle. Went to buy a 2018, but GM ruined them, so we kept our 2014. 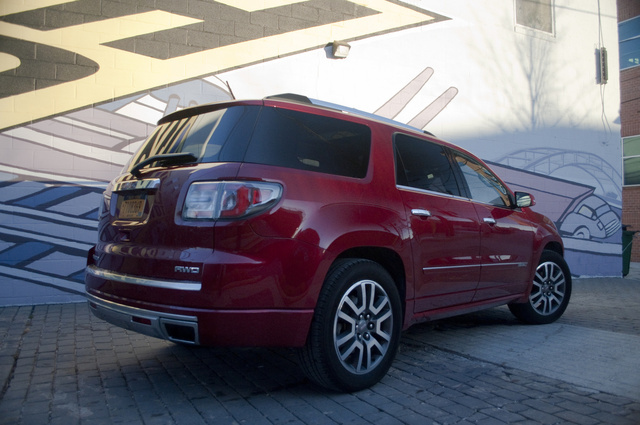 Have you driven a 2014 GMC Acadia? Is one responsible for overage miles, if they decide to buy the car, once lease is over? I sold my car myself. How do I take it off car gurus?